The constellation Pisces is visible in the southern sky in the Northern Hemisphere in November. But the stars in this fishy constellation are quite faint. Recently, we had a "psychic fair" in my hometown, and out of curiosity, my wife and I decided to see what it was all about. We were astonished to find lines of people, all willing to shell out their hard-earned money to have a conference with mediums who supposedly could see their future using tarot cards or holding a charm that oscillated back and forth over some mystic-looking chart. We even saw one person reading people's palms. I then asked her a question: If the two of us were outside under the stars that evening, could she point out any of the 12 zodiacal star patterns? She giggled a bit, then said, no. She really would not be able to identify any of the stars or constellations. "Maybe the Big Dipper," she said (which isn't even a constellation), "but I do all of my work based on charts of the sky." She also confessed that she couldn't even tell one planet from another in the real sky. "But," she chuckled, "I can find the moon when it's up." As I walked away, she said, "I really am very accurate. Would you care for a reading?" "No thanks," I responded. "It all sounds fishy to me." I came up with that particular retort as a metaphor for our current evening sky. There are very few bright stars in the southern evening skies this week. Little can be seen there when the sky is hazy or flooded with moonlight. But on clear, moonless evenings, you will find some interesting constellations in this part of the sky, though their figures are all rather vague and dim, similar to some sort of a dark pool. These watery constellations consist of Capricornus, the sea goat; Aquarius, the water bearer; Pisces, the fishes; Pisces Austrinus, the southern fish; Cetus, the whale; and finally, Eridanus, the river. They may have symbolized the rainy season, or they may have commemorated a great flood of long ago. There is also a mythological connection between these star pictures and an ancient great flood in the Tigris-Euphrates basin, which has sometimes been linked to the deluge depicted in the book of Genesis. It's difficult to say for sure, because the original significance of many starry figures was lost when the Greeks recast the display with characters of their own legends. Of the 12 constellations belonging to the zodiac, the faintest is Cancer, the crab. Were this collection of stars not one of the 12 signs, they likely would not be deemed important at all. 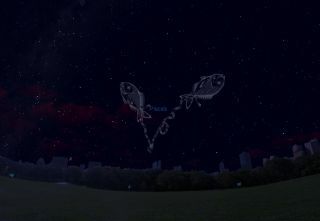 The same thing might be said of yet another zodiacal member, Pisces the fishes, which is visible high in the southern sky this week between 8 p.m. and 10 p.m. local time. Like Cancer, none of Pisces' stars shine brighter than magnitude 4 (you can learn more about the magnitude brightness scale here). But unlike Cancer, Pisces does have a striking, though not bright pattern. It is supposed to represent two fishes, each one caught on a fisher's line (some say it's a ribbon), and both lines are tied together at a little star called Al Risha (Arabic meaning, "the cord"). In his classic children's book "Find the Constellations," H.A. Rey suggested that the northern fish, a small triangle of faint stars, might be considered as a herring, while the western fish, often called the "Circlet," could be visualized as a flounder. The whole constellation takes the form of a straggling "V," which seems to hover directly below the Great Square of Pegasus. Just to the east (left) of the Circlet is that point in the sky that marks the vernal equinox, where the sun arrives each year on March 19 or 20, when spring begins in the Northern Hemisphere and autumn in the Southern Hemisphere. Currently, the sun is on the opposite side of the sky, so Pisces and the other surrounding watery groups are well-placed to be seen at night. Pisces also has some historical affinities, including one related to Christmas. To the early Israelites, Pisces was a sacred part of the sky, known in some circles as "The House of the Hebrews." Planetary gatherings or other occurrences of astrological significance that occurred in the Pisces constellation were regarded as harbingers of important events. For example, a favorite explanation of the Star of Bethlehem is a planetary grouping involving Mars, Jupiter and Saturn that took place in Pisces in February of 6 B.C. This is demonstrated at many planetariums around Christmastime. The legend of Pisces can be traced back to a wild picnic party among the gods that was interrupted when a large, ferocious monster called Typhon suddenly appeared. To escape him, each god changed himself into an animal and fled. Cupid and Venus, the god and goddess of love, escaped the monster by jumping into a river and assuming a piscine form. They are said to have bound themselves together so that, in escaping the monster, they would not be separated. I've always found it interesting that Typhon, who is also prominently mentioned in the legends of Aries, the ram, and Capricornus, the sea goat, was himself never made into a constellation. Perhaps it's because all of the renderings depicting what he supposedly looked like were all so radically different, at least of what I've seen. I don't know why, but every time I mention Typhon, either during a planetarium lecture or when giving a star talk under the real sky, I visualize the legendary professional wrestler George, "the Animal," Steele. I'm sorry I ended this fish tale on that note. Now I feel so gill-ty.